It’s been two months since we did an update on this Intex Deluxe Air Mattress, so it was about time we revisit the whole story and update it with some fresh info and customer experiences. 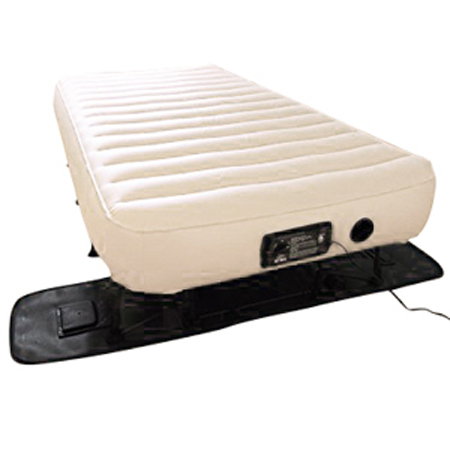 Let’s see what made this bed second top-rated Intex air mattress. 5.4 Why do we like it? Height 16.75 " 19.5 "
With that out of our way, let’s get to the meat of our review. We’ll go over the official product specification, followed by some freshly gathered positive and negative experiences of recent buyers. Unlike, let’s say, Fox info sheets, Intex ones are pretty generous with the information they share with us right of the bat. So, instead of digging for info, we can simply test everything the manufacturer just said; and we did. Before we get all technical and numbers-oriented, we’ll see what the customers had to say about their own personal experiences with this bed. We’ve contacted over a hundred recent buyers, and they gave us a mother-load of useful data. The price is insanely affordable! I needed a quick and painless solution during the move, and this bed was right on the money! It feels just like a proper bed with the extra height. I had some low air mattresses in the past that I used for camping, but this is an entirely different story. Just throw some sheets over it and it turns into a regular comfortable bed right before my eyes! First of all, we need to address the insane price of this model. Budget-friendliness was always something we recognized Intex for, but a decent air bed going for 30 bucks is just bananas. It respects the limitations of our budgets, but still offers a decent quality product for the price tag (especially having in mind that it features one of the better inner chamber designs in the price range). If we had to find it a proper place among other Intex products, we would say it falls somewhere between the Classic Downy and Comfort Series. So, it’s nothing to sneeze at. It’s a raised model, meaning it mimics the feeling of a regular bed. We’ve heard it time and time again that people simply don’t like to feel like they’re camping in their own bedrooms. With high-rise product such as this one, that feeling is as good as gone, and the sturdy raised pillow-rest is a great touch as anybody who ever “chased” a pillow on an air mattress will tell you. We also like the construction. It’s very sturdy, and can take some pretty heavy beating. This proved to be true during both our tensile and pressure tests. We’ve put way more weight on it than it’s supposed to handle, and it still held without any popped seams or other forms of damage. The vinyl chosen is pretty strong as well and won’t go down without a fight. It’s not as well made as the best Intex out there – the Intex Durabeam with Fiber-tech technology, but the Durabeam is an airbed that’s been in the top 3 overall for over a year now so that doesn’t change the value for money the deluxe offers. The inner design features vinyl beams similar to those found in Comfort Series with the latter being a bit higher quality, which is reflected in the price. The pump can hold its own and inflates the bed in about 4 minutes, which is pretty damn impressive, again, considering the price of the whole package. We inflated and deflated the mattress a hundred times, and we didn’t notice any hiccups as far as the pump is concerned. We even inflated it with some weight on top and it still did the job. The pillow rest, however, is more of a gimmick intended to make it look like there’s a lot going on here, but people mostly didn’t like it. If you like a really low pillow or if you’re sleeping on your back you might enjoy it, otherwise you’ll need a real pillow. Definitely boom in our opinion. We have a proper level of comfort, sturdy construction, good inner design, powerful pump and no air leaks. We can hardly ask for more even when it comes to more expensive pieces. We hope this review did its job and helped you make the right decision whether to buy this model or keep on looking. If you want to see how it fared against other Intex products, you can find it in our guide on their best mattresses.